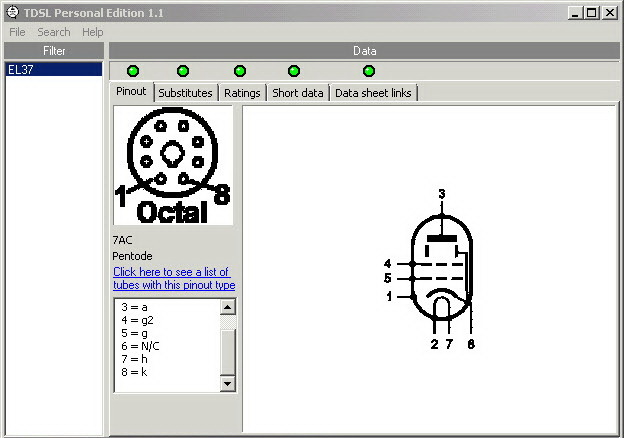 The TDSL (Tube Data Sheet Locator) Personal Edition provides information right on your PC for a large number of vacuum tubes. Advanced searching facilities help you to compare different types and make substitutes for hard to find vacuum tubes. It is intended to be of interest to amplifier technicians, amp modifiers, hobbyists and students. Substitutes tab: Display substitutes for over 8,500 vacuum tubes. These are graded into four categories: (1) Close/Identical, (2) Different rating or performance, (3) Different pinout/basing, (4) Different filament voltage. Ratings tab: See the maximum ratings and filament voltages for over 3,600 vacuum tubes. Short data tab: Displays real world application data for over 1,700 vacuum tubes. Data sheets tab: As if the features above are not enough, TDSL PE includes Internet URLs for over 9,500 vacuum tubes where you can click to see a data sheet on the web or visit the site which hosts the data sheets. * A simple mouse click will fire up your favourite web browser and access everything automatically for you.